As a responsible business owner, control and knowledge of who is granted entry and when is vital to smooth business operations. You’ll want to install commercial grade locks on all doors and windows, as well as any cabinets that may hold sensitive business information. Proper commercial locks are a different animal than the locks commonly found in residential security systems. Commercial locks are often considerably more heavy-duty than those used in a residential scenario, and may include hardware such as panic bars, keyless entry locks, closer arms, floor closers and overhead closers, as well as a wide range of choices in access control systems. To start, if you’ve just moved your business into a new commercial space, you’ll want to change or re-key all of the locks, to prevent potentially dangerous or costly access by previous keyholders. When re-keying your commercial locks as a tenant, be sure to carefully review obligations and rights according to local law and your lease contract. You may be required to get authorization from the landlord and provide a master key. When you go about changing locks, there are a number of options for security and convenience that you can consider.If you have a fairly large office, for instance, you probably won’t want to carry around a heavy ring full of keys, so one solution to consider is a master lock system by which one ‘master key’ can grant access to all locks within the system. This allows the business owner or other responsible parties to have consistent access to all locks within the system, without carrying an unruly number of keys around. While you’ll certainly want to have reliable, high quality locks installed on all doors, windows and cabinets in your business, not all commercial locks are created equal, and you’ll certainly want only the strongest, most reliable and pick-proof high security locks on your most sensitive entry points such as your safes, alarm control boxes, inventory area and network room. For doors in smaller offices or for restricted areas in some businesses like executive offices, network room, cash handling room, keyless entry locks may be preferred for an additional layer of security. These locks have a numbered electronic keypad built in, with changeable password to control entry. Now that we’ve covered the options of keeping your valuables safe from unwanted intruders, how about keeping your most precious assets safe in emergencies? In accordance with federal OSHA code governing safety in workplaces or local municipal code in most Connecticut towns, if your building exits do not have properly functioning panic bars (also known as “Crash Bars”) installed, you could not fatalities. Bob Locksmith will make sure your exits are equipped with high quality crash bars conforming with relevant codes. 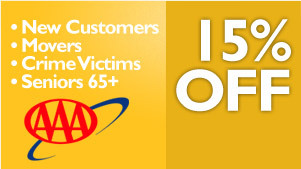 Also, consider if you need an alarm-rim, which often is tamper and weather proof. Last but not least, let’s talk about that most unfortunate of lock related concerns—the office lockout! Even if your existing security system is down or your keys have been lost, you’ve got customers to serve and the show must go on! You can’t afford to be locked out of your business. That’s why Bob Locksmith has a team of highly qualified locksmiths in over 50 locations throughout Connecticut who can provide 15 minute emergency response 7 days a week and 24 hours a day. You’ll be back in business before you know it. With so many commercial locksmith options to consider, it’s easy to see why Bob Locksmith’s policy of employing knowledgeable experienced technicians, providing honest, pro active consultative support and standing by our transparent pricing structure has been so instrumental in our growth. 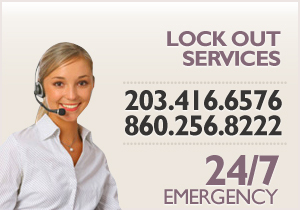 Call Bob commercial locksmith (203)416-6576 or (860)256-8222 in Connecticut for a free consultation or quotation.